Once installed, any SVG image can be displayed using the native IDE components just as with the bitmap-based formats (.bmp, png, .jpg,…). 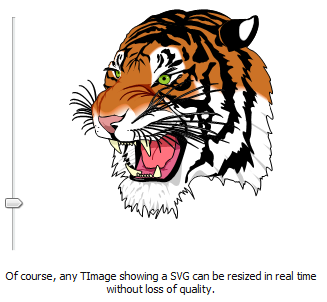 All components using TGraphic support SVGs, among which: TImage, TPicture, TCanvas. Always get the best image quality whatever the dimensions / resolution. You don’t need to edit the image if it needs to be resized. Tiger credits. When an SVG is used to display an image, its quality does not change, even when the image is stretched. This feature offers a certain advantage when the application has to support the high dpi, because the resizing of the images naturally accompanies the interface. SVGs fully support transparency. No more anti-aliasing issues experienced with bitmap based images. The SVG standard natively supports complex animations and SVGMagic fully supports them. SVGs are incredibly smaller than bitmap based images, even when compressed. Furthermore SVGs also support compression. SVGs are widely used for internet graphics, and several well known and powerful creation tools are available, like Inkscape or Adobe® Illustrator. In addition, you don’t need to create all SVGs yourself as there are plenty of vector image libraries available online. SVGs can easily be expanded to other components such as buttons, checkboxes, radiobuttons, popupmenus and many more. SVGMagic is used on a daily base in commercial software like CopyTrans. The SVG standard allows to obtain spectacular effects including animations, then to change them completely without modifying one line of code. You can start by downloading the provided demos. There are two ways to use the SVG graphic component. 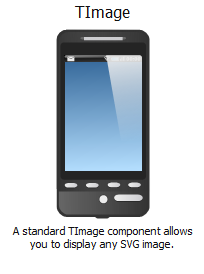 You can either use it natively, through the VCL TImage component. In this case, simply put a TImage on your form, then open the Picture property to load a file, and select the SVG file to open as any other image. 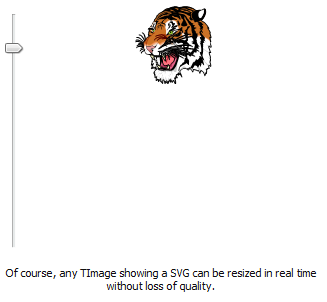 How to manually change SVG animation position of SVG loaded in TImage? How to manually change the animation position of the TWSVGImage? Make sure to read installation instructions. Open your Embarcadero RAD Studio IDE, then from menu “Component” -> “Install Packages”, click “Add…” button, and browse to c:\Users\Public\Documents\Embarcadero\Studio\[Product Version]\Bpl\WSVGD.bpl file, then confirm twice with “OK”. SVGMagic works on Windows 10, 8, 7, Vista and XP and is available for RAD Studio 2010, XE, XE2, XE3, XE4, XE5, XE6, XE7, XE8, 10 Seattle, 10.1 Berlin, 10.2 Tokyo, 10.3 Rio. All licenses come with 2 years of free updates and support. For other licensing options, please email us at hello@svgmagic.io. If you have any question, suggestion or you need help, please don’t hesitate to email us at hello@svgmagic.io. SVGMagic supports a wide array of SVG attributes, however the SVG standard contains a very large amount of properties, and it is possible that one is not supported yet. Please don’t hesitate to contact us and we will be happy to add the missing feature to the library. SVGMagic was designed for our own project needs. With around 50’000 line of Delphi code, and after more than 2 years of intensive work, SVGMagic significantly shortens our development time and allows our applications to provide a cleaner user experience. It’s the reason why applications like the CopyTrans are using it. SVG is a graphic standard based on vectorial rendering, that allows to draw images without loss of quality, regardless of the size and resolution, and with considerably smaller image file size. The format is widely used for graphics on the internet and all recent browsers support it. In addition SVGs natively support animations. SVGMagic® is a trademark of Ursa Minor Ltd. All other trademarks referenced herein are the property of their respective owners.